102,000,000 That's how many results appear if you search 'email converter' on Google. So, you have to ask yourself: Do you want to start converting your emails quickly, easily, and effectively, right now?...Or do you want to start picking through those millions of search results and reading those endless gigabytes of information? GOOD NEWS! We did the research for you. We took 4 of the most popular email converters on the market and tossed them one-by-one into the gladiator pit to face off against Total Mail Converter for ultimate victory. We meticulously compared their features, options, performance, and value so that you wouldn't have to. Each claims that they are the best at converting MSG/EML to PDF and other formats. Gladiators take your positions! It's judgment day for email converters! Things got a little bloody in there, but here are the results. Aid4Mail requires that you to know what program created the MSG files you are going to convert. 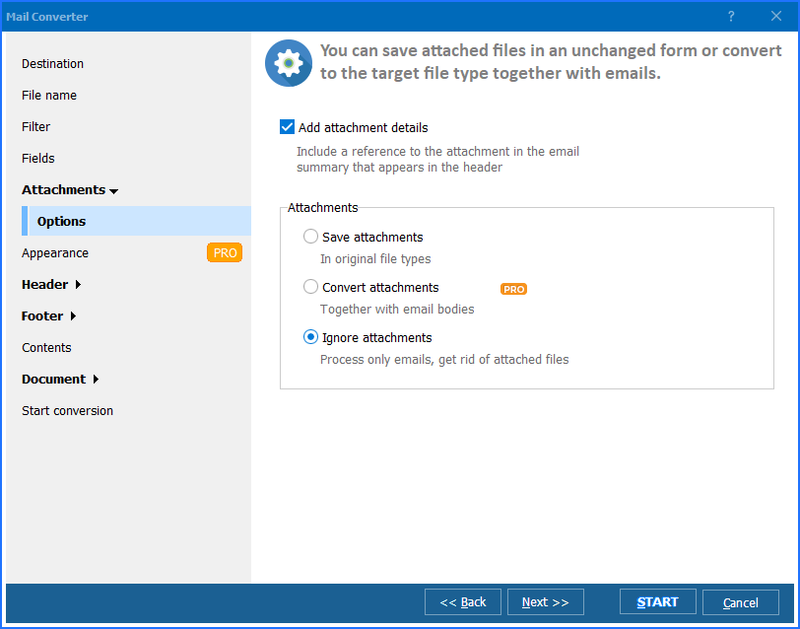 Aid4Mail has less options for page formatting and processing attachments. 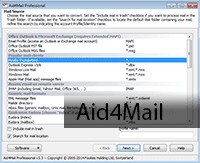 While Aid4Mail does offer some additional options, Total Mail Converter is still a step ahead. For example, both programs offer selecting PDF page format and page size. However, Total Mail Converter supports a wider list of sizes, formats and fonts. Besides, Total Mail Converter can produce PDF, PDF/A and non-searchable PDF. Here is a thorough comparison of Aid4Mail and Total Mail Converter, so you can get into more detail. From a value perspective, Total Mail Converter still comes out on top. Total Mail Converter costs $59.90 for a lifetime license (commercial use) with all the same features and more, while the users of Aid4Mail get just ONE YEAR of service for the same $59.90! Call out the stretcher - Aid4Mail needs help after that defeat! 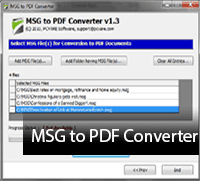 MSG to PDF Converter can convert MSG to PDF, but offers very limited additional options. By 'very limited' we mean.. none. You select MSG files one by one or upload a folder with emails, then press Convert To PDF button and get the results. The trial version allows converting just ONE(1) MSG file, so you have a very small sample size to work with. Granted, the price is quite competitive at $29.90 per Personal License and $49 for Commercial License. However, once you hit the purchase button, you realize that it's just a 1-year subscription, not a lifetime license. The company also offers a 30-day money back guarantee, which again turns out to be very conditional if you read the whole Refund Policy. The home page of MSG to PDF Converter lists 10 file naming options and two attachments saving options (embed in PDF file or save in separate folder). Unfortunately there is no chance to test them in the trial version. If you are on a tight budget and have just a few MSG files, then MSG to PDF Converter is a reasonable choice. Just remember to unsubscribe from the service unless you want to be charged another $29.90 the following year. On the flip side, Total Mail Converter delivers a powerful batch MSG converter backed by a 30-day full functional evaluation version. Go ahead and hit us with your best shot! Convert a dozen folders with hundreds of MSG files in each! BAM! In a flash you'll have perfectly organized PDF files. Total Mail Converter can produce PDF, PDF/A and non-searchable PDFs; one PDF for one MSG or combine several emails into one multi-page PDF. It can also give new descriptive names to your converted files, add date or pagination, as well as user permissions and a digital signature. It's far richer in options than MSG to PDF Converter and the price starts from just $49.90 for a lifetime license. NO HIDDEN FEES! Sorry about that MSG to PDF Converter, I hope we didn't leave any scars! After what happened to the previous two challengers, Birdie MSG to PDF Converter was a bit nervous about challenging Total Mail Converter, but we insisted! The batch option is available only in the licensed version for $49, but there is no chance to test it before buying it. Birdie also offers a Commercial Version for multiple users ($59) as well as its premium Command Line Version ($129). The settings are similar in all paid and free versions: you can chose file name options and save attachments options, which can be embedded in PDF or saved in a separate folder. Now let's have a look at Total Mail Converter. The 30-day trial version provides batch conversion immediately without any additional payments and it can offer you a wide range of tools and options. You can add a new name to each output PDF file by any template you set or saving time with conversion only those parts of emails that you really need (fields like sender + body). And you don't have to pay for the choice to use interface or command line to manage the conversion, because both of them are available in all versions of Total Mail Converter. 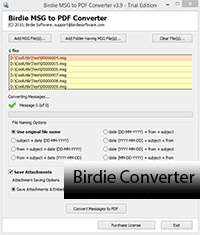 Total Mail Converter and Birdie are both priced from $49.90 for a lifetime license and both feature similar outstanding software. The first main difference is the batch conversion option. 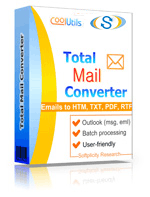 Total Mail Converter proves the better choice considering its additional options. And the second main difference is the names: I'm sure you'd agree, Total Mail Converter is a much cooler name than Birdie! SoftSpire MSG to PDF Converter makes PDF files out of MSG including all the email's elements like To, Cc, Bcc, From, Sent & Received date, Attachments, Email Formatting. The Demo version converts one MSG file at a time only and does not support batch conversion of MSG files to PDF. There is no possibility to choose how to convert attachments - embed to a PDF or place them into a separate file. This option is supported in the paid version. For $49 you get the opportunity to convert MSG files to PDF in batch, adding multiple files at a time, and for $129 - to use command line in the Pro-Edition version with standalone EXE (suspiciously similar to Birdy). Ultimately, Total Mail Converter proves the better value with a superior price/functionality ratio. 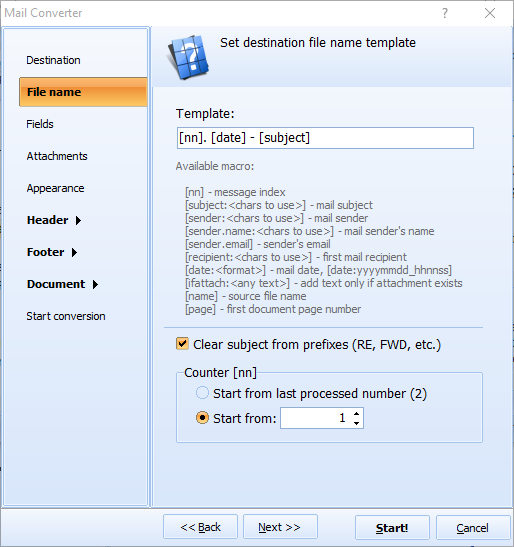 Total Mail Converter uses both MSG and EML as source files and the target formats list is even more extensive: TXT, PDF, HTML, RTF, DOC, XLS, TIFF, JPEG. Furthermore, Total Mail Converter delivers a variety of superior tools: fast batch conversion, command line as well as wizard, possibility to make one PDF file from all the letters, add name, headers and footers to the output files, even add a counter to the file names. 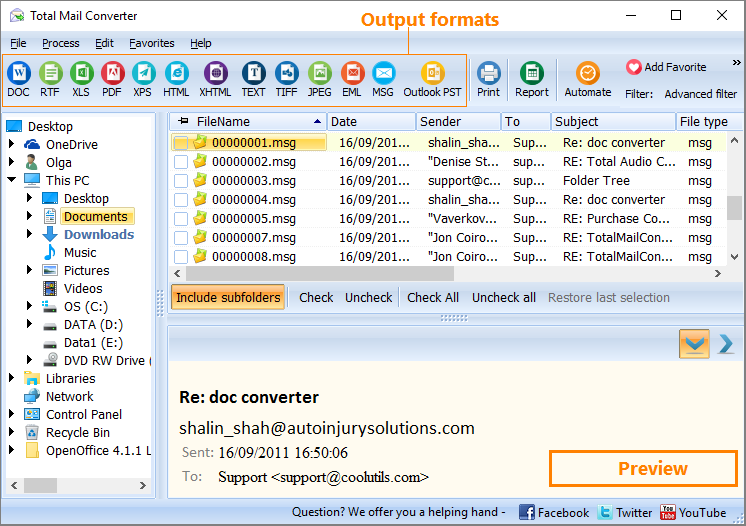 Total Mail Converter offers all the options and features to convert MSG files to PDF in a fast and easy way. Plus, you get the full functionality provided in the 30-day free trial version or the lifetime license starting from just $49.90. Overwhelmed with all this info? 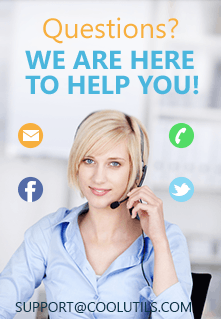 Here are all the benefits of Total Mail Converter over all the competitors at a glance. Are you still thinking? Grab your copy of the most powerful MSG/EML converter now! If you have more questions, don't hesitate to ask. We will get back to you the same day. We are also open to minor customizations to tailor Total Mail Converter to your needs.